The estate is located in the middle of vineyards, on the remains of a 17th century chapel, at the foot of the Châteauneuf du Pape hills. 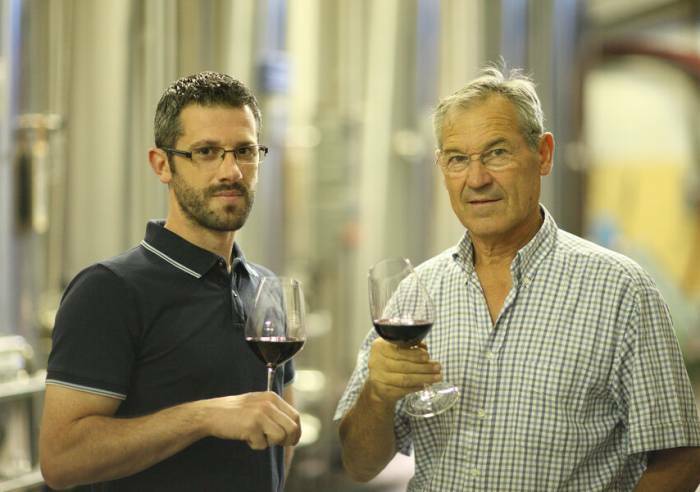 Gérard and Eric, continue the family tradition, heading this 50 hectare estate which includes appellations such as Châteauneuf du pape, Côtes duRhône, CDR Villages and CDR Villages Cairanne. From 2014, all wine produced will be labelled ORGANIC. The estate is open from 8.30am-5pm (4pm on friday) except Wednesdays when it is closed between midday and 1.30pm. Weekends, by appointment only. Closed on public holidays. Thanks to the hard work, talent and high standards of its owners, the estate is enjoying a new lease of life. Accommodation available on site. -Tasting sessions for individuals, free of charge no booking required. -Tasting sessions and tour of cellars available for groups by appointment (maximum of 50 people). Group rates: tasting, EUR 2/person – cellar tours, EUR 6/person. -Buffets and lunches can be arranged for groups on request. Please contact the estate for details. -Cellar tour available in English for groups. Reception room, Car park, Coach parking Sales on site, International export.